This day of spring fun will center around a downtown-wide egg hunt, where children 12 and under can go from business to business collecting eggs and treats. Children are encouraged to dress in their Sunday best for form their very own Easter Parade. Maps of participating locations will be available at Georgie Lou&apos;s on the day of the event. Join us as we celebrate 20 years with an open house. Customers will receive 20% off their purchases all day. And we welcome Richelle Dourte, jewelry artist, as our Artist in Action. Artists in Action is a demonstration series offered by Village Artisans Gallery. The "Artist in Action" for the afternoon sets up a temporary studio in the gallery where you are invited to be informed and entertained while watching the artist at work. It&apos;s a wonderful opportunity to talk to the artist in person and see first-hand how their work is created. Richelle collects and presses tiny baby flora which she then turns into earrings and pendants by encasing them in resin framed in various metals. Dickinson will host its 12th Annual Local Food Dinner—a celebration of food, farmers and community—on Saturday, March 28, in the Holland Union Building (HUB), 28 North College Street. Tickets can be purchased online beginning March 9 at http://www.brownpapertickets.com/event/1321360. The menu features kale and apple salad, vegetarian chili, French onion soup, stuffed mushrooms, roasted root vegetables, beef bourguignon, apple-stuffed pork loin and sweet potato pie. All food is sourced from farms in South Central Pennsylvania. This year’s keynote speaker is Forrest Pritchard, owner of Smith Meadows Farm in Virginia and author of “Gaining Ground,” a memoir of his experience in transitioning the family farm from conventional practices to a more sustainable and viable farm operation. Before Mary Lambert achieved “quasi-stardom” (as she puts it in her typical self-deprecating way) for writing and singing the hook on Macklemore & Ryan Lewis’ marriage equality anthem “Same Love,” the Seattle native was an aspiring singer-songwriter who also worked as a brunch waitress and bartender. After years of struggling both financially and personally, Lambert suddenly found herself signed to Capitol Records, releasing an EP (Welcome To The Age of My Body), getting nominated for two Grammy Awards (for “Song of the Year” and “Album of The Year”), and making history performing on the Grammy telecast with Macklemore, Lewis, and Madonna. Allenberry presents "A Diva to Die For" by Jacqueline Heinze. You&apos;re invited to the most killer party of the year! Celebrate all weekend long at Astara Vanderbank&apos;s shockingly stupendous, super-sensational Birthday Bash. Join her and her filthy rich family as they host an extravagant weekend of non-stop, top-quality food and drink, celebrity entertainment, and all the drama this die-hard diva could dream of! Allenberry is in its 27th year of producing these original, interactive, mysterious, murderous, comedic, musical weekends. Our weekend package features two nights lodging, five gourmet feasts, two hors d&apos;oeuvres parties, music, dancing, prizes, and a Murder & Mystery performed by a professional cast. The South Mountain Speaker Series invites you to learn more about the mills of Cumberland Valley in collaboration with the Cumberland County Historical Society and Cumberland Valley Visitors Bureau. The Historical Society will host an opening reception of their new mill exhibit from 6 to 7 pm. Guests are welcome to stay for a presentation about the cultural and bio-physical legacy of mills in the South Mountain region. Admission: General admission for adults is $15/person and $8/student. VIP Reserved tickets for adults are $25/person and $15/student. The Luhrs Center welcomes the Nitty Gritty Dirt Band back to the Grove Theatre stage this March! Nearing their fifth decade together, the iconic and profoundly influential Nitty Gritty Dirt Band, often cited as a catalyst for an entire movement in Country Rock and American Roots Music, continues to add to their legendary status. With multi-platinum and gold records, strings of top ten hits such as "Fishin&apos; In The Dark" and "Mr. Bojangles", multiple GRAMMY, IBMA, CMA Awards and nominations, the band&apos;s accolades continue to accumulate. Their groundbreaking Will The Circle Be Unbroken album has been inducted into the U.S. Library of Congress as well as the GRAMMY Hall of Fame. NGDB’s recording of "Mr. Bojangles" was also inducted into the GRAMMY Hall of Fame in 2010. Today, NGDB (Jeff Hanna, Jimmie Fadden, Bob Carpenter, John McEuen) continue their non-stop touring in their 49th year together. Their most recent studio release was the critically acclaimed album Speed of Life. Disney’s BEAUTY AND THE BEAST, the smash hit Broadway musical, is coming to Shippensburg! Based on the Academy Award-winning animated feature film, this eye-popping spectacle has won the hearts of over 35 million people worldwide. This classic musical love story is filled with unforgettable characters, lavish sets and costumes, and dazzling production numbers including “Be Our Guest” and the beloved title song. Disney’s BEAUTY AND THE BEAST is the classic story of Belle, a young woman in a provincial town, and the Beast, who is really a young prince trapped in a spell placed by an enchantress. If the Beast can learn to love and be loved, the curse will end and he will be transformed to his former self. But time is running out. If the Beast does not learn his lesson soon, he and his household will be doomed for all eternity. 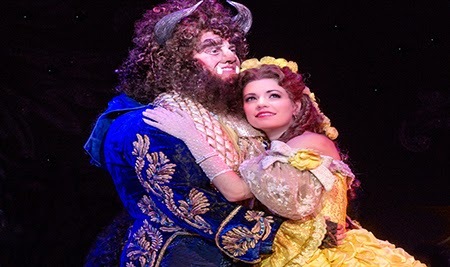 Experience the romance and enchantment of Disney’s BEAUTY AND THE BEAST at the Luhrs Center! View our entire events calendar here!